The man whose innovations in surgery changed the face of modern medicine is now memorialized in a permanent tribute near the University of Pittsburgh Cathedral of Learning lawn. More than 150 people gathered on June 23 to watch the unveiling of a new sculpture of Thomas E. Starzl, “the father of organ transplantation,” who died on March 4, 2017, at the age of 90. The bronze sculpture depicts Starzl wearing a turtleneck, slacks and a sports coat, seated on the left end of an iron bench. “Burden of Genius,” a new documentary billed as “the story of an innovator as complex and elusive as the biological secrets he unlocked,” had its beginnings in a Pitt classroom. In 2014, Carl Kurlander, senior lecturer in the Film and Media Studies Program, taught a course called “Making the Documentary: Tom Starzl Transplant Pioneer,” in which Starzl had given permission for students to view selected materials from his massive archives, which he had donated to Pitt. They chose photos, news clippings and video that provided the basis for the film. “Burden of Genius,” directed by Tjardus Greidanus and produced by Kurlander and Laura Davis, premiered in March at the Cinequest Film Festival in Redwood City, California, to rave reviews and in April won the $7,500 Global Health Competition prize at the Cleveland International Film Festival. The film has also had several private screenings around the country and is currently being shopped for distribution, which will determine the best outlets for the film to be shown to the public and educational partners around the world. Its next screening is at the upcoming Transplantation Society International Congress in Madrid, Spain. The film has been warmly received by audiences, and several people told the filmmakers that after viewing it, they were changing their organ donor status. “You can’t get much better than that in terms of making a meaningful movie,” said Kurlander. Joy Starzl, the late surgeon’s wife and the force behind the project, let out a happy squeal as the tarp was pulled away and immediately sat down on the bench next to the sculpture amid applause and cheers from the crowd. 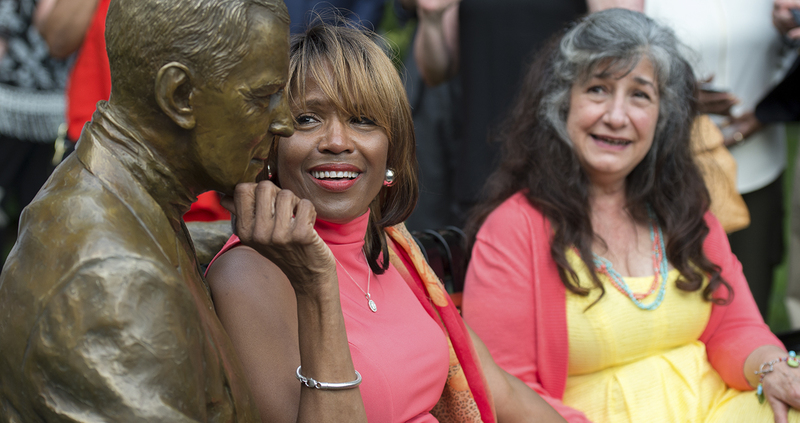 In attendance were friends, former colleagues of Starzl, some of his former patients and sculptor Susan Wagner, who had worked on the piece in her garage in Pittsburgh’s Friendship neighborhood over the last year. Starzl was chief of transplantation services throughout most of the 1980s at what was then Presbyterian University Hospital in Pittsburgh’s Oakland neighborhood. He grew a fledgling program into what would be the largest and busiest transplant program in the world. In 1986, he performed the world’s first heart-liver transplant on 6-year-old Stormie Jones from Fort Worth, Texas. Although the young girl died from organ rejection six years later, the procedure paved the way for hundreds of heart-liver transplants to follow. Stormie’s mother, Lois A. Purcell, traveled to Pittsburgh for the statue unveiling. “Dr. Starzl used to come and pick us up at the airport,” she said, referring to the countless trips she made to Pittsburgh with her daughter. In addition to his pioneering spirit, Starzl’s humanity was a common theme throughout the evening. 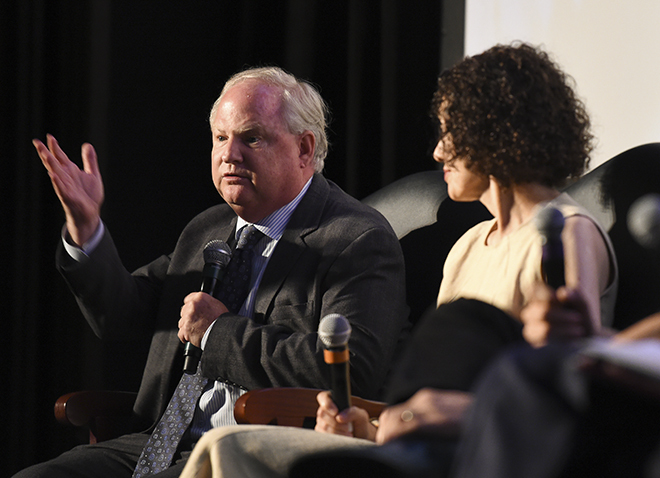 Before the unveiling, more than 700 guests attended a private screening of “Burden of Genius,” a documentary that explores the surgeon’s foray into transplantation — his challenges, failures and successes as he pushed the boundaries of medicine — but also his humble qualities. Even during the height of Starzl’s career, when four transplant teams were operating simultaneously, the busy surgeon refused to carry a pager. Nurses and transplant coordinators were sometimes known to call the local Kunst Bakery or Original Hot Dog Shop to track him down. More than once, the words “Dr. Starzl, Please Call Your Office” were flashed on the Jumbotron at Three Rivers Stadium during sporting events. More information about Starzl’s life and career is available at the official Thomas E. Starzl website. His work continues through UPMC’s Thomas E. Starzl Transplantation Institute. Susan Wagner’s fascination with artistic carving and sculpture began at age 3. As a toddler, she molded small figures from the red clay left behind by bulldozers at a construction site next to her parents’ Penn Hills, Pennsylvania, home. From then on, she was always sculpting or sketching something, even drawing designs as a child onto a bedroom’s newly varnished floor. “I got in trouble for that one,” Wagner said. Later, armed with a bachelor’s degree in studio arts from the University of Pittsburgh, she struck out on her own and began sculpting figures that eventually made their way to private collections and community spaces, including some in the Vatican as well as at a few favorite Pittsburgh locations. Wagner created the stoic police officer in the officers’ memorial on Pittsburgh’s North Shore, the children and sea lion exhibit at the Pittsburgh Zoo & PPG Aquarium and the 12-foot-high likenesses of Pittsburgh Pirate greats Roberto Clemente, Willie Stargell and Bill Mazeroski that fans and visitors can view at PNC Park. She met Starzl several times before his death in 2017, including when he and his wife, Joy, paid a visit to her home one winter evening. That visit was a memorable one, she said, because she was “struck by Starzl’s sensitivity and empathy to every issue,” as well as the mutual love that bounced between him and Joy. “They were like a couple of teenagers,” said Wagner. She studied Starzl intently and, after he passed, spoke to his wife many times about him. The figure that now sits on Pitt’s campus came to life in Wagner’s garage studio, and she said it was Joy’s idea to have him seated on a bench, so people could engage with the piece.